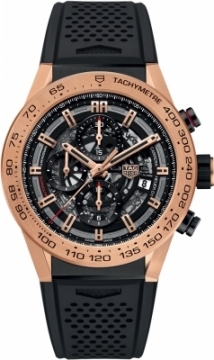 Buy this new Tag Heuer Carrera Caliber Heuer 01 Skeleton 45mm car2a5b.ft6044 mens watch for the discount price of £8,925.00. UK Retailer. Bezel: 18kt rose gold with black engraved tachymeter scale. Applied brushed & polished rose gold plated index hour markers with luminous fill. Date disc with black plated skeletonized date numbers, white background located at between 3 & 4 o'clock position to indicate the current date.